ABC Local Radio is Australia's emergency services broadcaster. Many people in the Derwent Valley area who cannot receive ABC local radio on the regular 936AM frequency can instead tune in to 89.7FM. This service on the FM band is specifically for the Maydena area but can also be picked up in surrounding areas including New Norfolk. 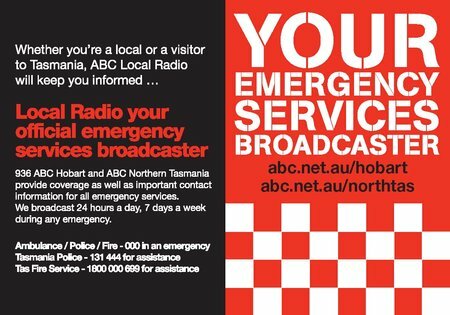 Please be aware that the service originates from Launceston's ABC 7NT and some programs are different to those broadcast in Hobart, but the emergency warnings cover the entire state.